In aeronautical terminology, “Power Curve” explains the relationship between aerodynamic drag and airspeed. It can describe the interaction between the power required and control of the aircraft; to make the airplane do what you want it to do. Put simply, it means that if a pilot can keep the airplane ahead of the power curve, maintaining airspeed requires less power but provides maximum efficiency. Behind the curve takes maximum power and produces little or no results. 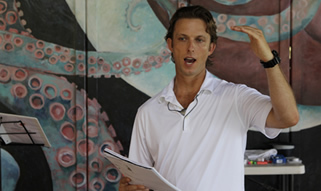 As a peak-performance coach and flight instructor, I founded Power Curve Coaching to help you design a flight plan for your life so you can take off towards your true destiny. In order to achieve success, we utilize coaching models that effectively work with all disciplines. We work to bring all areas of your life together to achieve balance. This ultimately leads to opening the doors to endless possibility and eventually finding the real, successful you. It is vitally important to know and understand which areas of focus need to be worked on to help develop the person you want to be. A sample list is below for reference. So often, the primary fears (which we all have) can hold us back from achieving success. 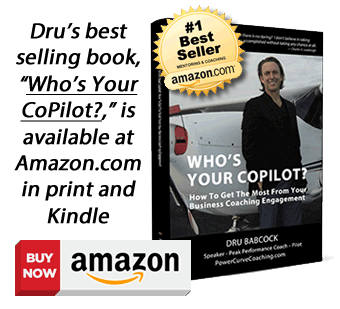 As an example, Dru Babcock is a certified Airline Transport Pilot who has the ability to instruct students to help obtain their own certification. He watched as some students gave up when faced with a difficult challenge. It was his job to quickly understand the reason it was happening so he could help facilitate them past it to earn their wings. The hurdle was fear. It was fear of not being capable, failing, or not being good enough. This often translates into our way of thinking that if we really aren’t good enough that we aren’t going to be loved. Fear is crippling in every sense. With this type of mindset there is only a very slim chance of success. The antidote for fear is to focus on success, or the desired outcome, and adding a grand meaning of service behind it. When we do something for the greater good nothing can stop us! This is the type of mindset for some of the most successful people in the world. Focus on succeeding and utilizing your strengths to achieve it instead of focusing on what could possibly go wrong. The key is, knowing what your strengths are and what outcomes you’d like to achieve. Do you have the right tools to get your life headed in the direction you want to go? If not, PCC can help you navigate through the darkest skies! If you are able to answer all three of these questions, you will be able to provide the solution for determining your current “Situational Awareness” or S.A. If you know your S.A. you will be able to navigate through the roadblocks that rise up in your life. Together, we can create the right plan that will get you exactly where you want to go. Life has its ups and downs, highs and lows, successes and disappointments, but, it’s what you learn from them and how you act that will determine how successful you are with your future. Are you ready to begin your new life? A beautiful destination is just beyond the horizon and all it takes to get there is getting to know who you really are.